Camera teams of unilateral service KSO-366 series produced by LLC "Belgorod plant" Energotechmontaght "in accordance with TU 3414-005-95641262-2006. Intended for acquisition of switching three-phase alternating current at 50 Hz systems with insulated neutral. For a complete switchgear voltage of 6 or 10 kV run blocks of six or seven cameras. cameras are equipped with switch-disconnectors type Hungary, voltage transformers of various modifications. When cameras are equipped with two-row arrangement with disconnectors, bus bridges or without them. Designed for acquisition of switching three-phase alternating current at 50 Hz systems with insulated neutral. 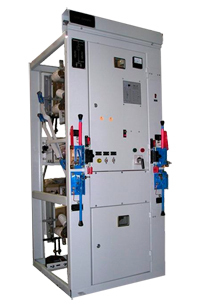 The enclosure can be installed in various switchgear high voltage. By appointment divided into chambers with load break switches (BHA), disconnectors (EEO), voltage transformers (3 * ZNOL). In 2006, LLC "Belgorod plant" Energotechmontaght "mastered release of cameras with vacuum circuit breakers manufactured by" TAVRIDA ELECTRIC "and sets of equipment RZiA. Equipment, relay protection and automation can be implemented as electromechanical relays, and with the use of microprocessor-based terminals.